The Box Office is located in the lobby of The Maltz Jupiter Theatre at 1001 East Indiantown Road. Tickets may be purchased over the phone or online using American Express, MasterCard, Visa or Discover, and in person using cash, check (at least 10 days out from the show) or credit card. Tickets will be mailed out or held at our Will Call window depending on the customer's preference and time frame when the tickets are purchased. All patrons, regardless of age, must have a ticket. There is a $3.00 processing fee for all phone orders and walk up sales. There is no processing fee for tickets purchased over the web (except for "The Taste of the Palm Beaches). Please bring a valid photo ID and the credit card used for purchase when picking up tickets at our Will Call window. If another party is picking up tickets you purchased, please provide authorization to the Box Office either in writing or phone call. The Box Office opens 90 minutes prior to each performance, and remains open until the end of intermission or, in the case of shows without an intermission, until 15 minutes after the performance begins. To order tickets by phone, please call the Box Office at (561) 575-2223 ext. 0 or (800) 445-1666 ext. 0. To fax an order, please fax the information to (561) 743-0107. Student Rush Tickets for our subscription shows, when available, may be purchased at the Box Office on the day of the performance only (subject to availability). Full-time students may inquire whether Rush tickets are available for a given performance by phoning the Box Office at (561) 575-2223 on the day of the show. Rush tickets CANNOT be ordered over the phone or online. One current, valid student I.D. card must be presented per ticket requested when purchasing Rush tickets. Children who do not have student I.D. cards are also entitled to this discount, but must be in attendance at the Box Office when purchasing Rush tickets. Our Gift Certificates can be used to purchase tickets for any of our limited engagements or season performances on sale at the Maltz Jupiter Theatre box office or over the phone. They cannot be used for any production or individual that rents our venue. Gift Certificates, for any denomination, can be purchased in person at the box office during business hours. The Maltz Jupiter Theatre is dedicated to providing persons with disabilities the necessary measures for a comfortable and enjoyable experience. Accessible seating for persons with disabilities is available in our orchestra level. Please be sure to mention any special seating request when placing your ticket order. Our lobby restrooms are also fully accessible. Headsets aiding in amplification and clarity are available for hearing impaired patrons on a first come first serve basis. Receivers and earphones are available free of charge and may be signed out prior to the performance using a driver's license or major credit card as a "deposit". Upon completion of use, your deposit will then be returned. They are lightweight and can be used in all sections of the theatre. -Patrons of any age whose behavior is inappropriate will be asked to leave the theatre at the discretion of management. -There are no refunds, but we do make exchanges for the same show. -Please silence all cell phones and pagers during the performance. -Recording devices of any type are not permitted in the theatre. -Except for bottled water, food and drink are not permitted inside the theatre. -Smoking is prohibited anywhere inside the Maltz Jupiter Theatre. -Late seating will be reserved to the discretion of management. 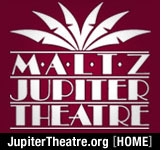 The Maltz Jupiter Theatre, Inc. is a 501(c)(3) not-for-profit organization. If you would like to support the theatre by making a tax deductible donation, please call 561-743-2666 ext. 122, or donate on-line.